Laura Wassmer told city staff that she would be leaving her role as mayor in January. The municipal elections may still be a months away, but Prairie Village politics got a significant shake-up Wednesday. 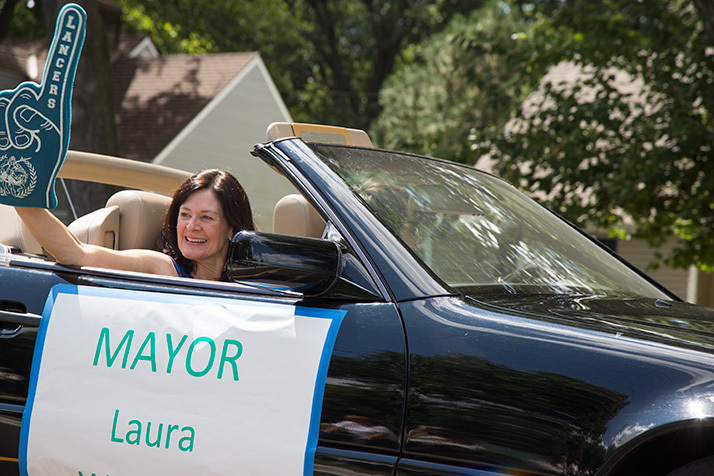 In an email to members of the city council and staff, Mayor Laura Wassmer announced she would not be seeking a second term. Eric Mikkelson went to the Johnson County Election Office Wednesday and filed to run for Prairie Village mayor. Submitted photo. Following Wassmer’s announcement former city councilman Eric Mikkelson announced he was filing to run for the mayor’s seat in this November’s election. (Prairie Village shifted its mayoral election cycle from spring to fall in adherence to state law, cutting Wassmer’s term short of a full four years). Wassmer is the longest-serving member of the governing body, having started her service as a Ward 4 representative on the city council 20 years ago. Following then-mayor Ron Shaffer’s election to the county commission in 2014, Wassmer’s council peers voted to have her fill the short remainder of his term before the April 2015 elections. She was unopposed in that race and elected to a full term. Early in her tenure, the city announced an agreement with VanTrust Real Estate and Johnson County Park and Recreation District that brought a new 84-acre public park to Prairie Village, along with new housing developments, on the site of the former Meadowbrook Country Club. She also presided over the council’s moves to secure the Faith Lutheran Church property for a new park at 67th Street and Roe Avenue. Earlier this year, her family’s involvement in a lawsuit against JPMorgan Chase over the company’s handling of her father’s estate took her away to Texas for a period of weeks. A jury found in Wassmer and her brother’s favor in the case, awarding them a total of $6 billion in punitive damages and around $10 million in actual damages and fees. He said he was running for mayor because he wanted to both “preserve and enhance” the city’s quality of life.